Refinancing a home is a long process that depends on several factors. Evaluate the following five factors to help you decide whether or not to embark on a refinancing adventure! One couple in our circle of friends wanted to sell their current home and buy one in a different neighborhood. Even though they have great credit scores and a strong working history, they couldn’t secure the new loan because one of them was self-employed. Because of their credit scores, however, they will be able to try again in the next year. This reality blows my mind, but it is a definite sign of the times. Although this was my friends’ specific set of circumstances, it reminded me of the importance of a strong credit history. If your credit score needs improvement, take time over the next several months and do what needs to be done to fix it before refinancing. If you’ve already improved your credit score from what it was before, you may be able to get a better interest rate or avoid mortgage insurance by refinancing. If there are only a few years left on a mortgage, refinancing will cost money versus save money. A monthly payment will be lower when the loan is extended over a long period of time, but the costs will be higher due to an increase in interest payments. It’s worth it to pay off the mortgage if possible. Before consulting a mortgage broker about interest rates, take a look at the rate on your current mortgage. This is important information to have in mind when considering refinancing, because the difference between the current and future interest rate needs to be big enough to make the process worth the time and effort. A percent – going from 6% to 5% – would probably make a big difference in the monthly payment and interest you’d pay over the life of the loan. Closing costs are fees paid to the businesses that process the loan. The last time we refinanced, we decided it would be worth paying the closing costs because we don’t plan to move for twenty years if we can help it. The difference between the mortgage we had and the one we refinanced into resulted in a $300 decrease in our monthly payment. Since closing costs were about $3000, it only took us ten months to realize the savings. If you don’t plan on staying in your home longer than a year or two, the cost of refinancing may not be worth it. Monthly payments are important, but so is the length of the loan. 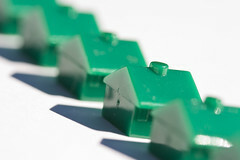 It might be beneficial to refinance for a fifteen-year instead of a thirty-year loan. A fifteen-year loan is at a higher interest rate, which saves money in the long run but increases the monthly payment. If this increase in a monthly payment busts your budget, considering adding money to your mortgage payment to help pay it down faster. It might also be possible for you to pay your mortgage every two weeks instead of once a month, which will also help! This is a guest post from Kelly Wilson. Kelly is a busy mom, freelance writer, and an expert at saving money, helping to find the best deals on insurance Portland has to offer.